Pictured at the Lord Leycester Hospital Brother John Maughan, the Master of Lord Leycester Hospital Heidi Meye, Chairman of Warwick District Council, Councillor Alan Boad and Brother John Wilcock. Several buildings and sites in Warwickshire normally closed to the public will be opening their doors next month for the annual free Heritage Open Days. Now in its 23rd year the organisers of the Warwick District event are delighted that more than forty venues will be taking part, many of which can only been seen by the public during September 7 to September 10 September. The Lord Leycester Hospital on High Street in Warwick will be participating for the first time this year with free admission on Sunday 10 September. 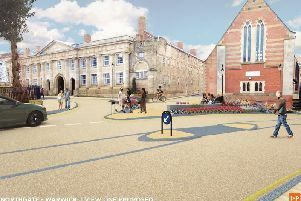 This will give visitors the opportunity to see a legacy of almost 450 years of history. Volunteers have also organised a number of special Heritage Open Day events including a World War I walk around Kenilworth with a re-enactor telling the stories of the town’s servicemen who fought in the Great War, showing the homes where they lived and the buildings that were put to war-time use. The Chairman of Warwick District Council, Councillor Alan Boad, said: “The Lord Leycester Hospital and World War I walk are just two of host of hidden treasures waiting to be discovered during the Heritage Open Day weekend. “This is a great opportunity for everyone to get out and about and see what our district has to offer and it’s all for free. A booklet listing all the venues taking part is available from libraries and visitor information centres.